I read a lot of writing books (as well as other nonfiction). You shouldn’t read them the way you read fiction. How to read for information: Set time aside. Sit away from your computer (don’t read on your computer or in your browser). 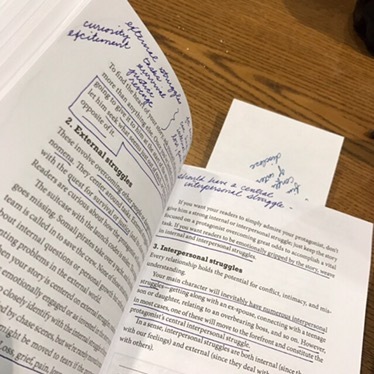 Have a pen or pencil handy (NOT a highlighter), and either write all over the book, or on Post-It Notes if it doesn’t belong to you. The important thing with studying is not to remember all the details – the memory doesn’t work that way! – but to develop a framework into which you can put some of the most important points and have a way of finding the less important ones. I’m a disorganized gulper of a reader, and at this stage of my life I’m not interested in just getting a vague impression of what a book is about. If I’m spending time with a book, I want to get something out of it or else abandon it. Read so you don’t have to re-read. I do not object to defacing books. In fact, you should deface the heck out of a good book. Write in it. Draw arrows, and pictures. Comment. However, you will be tempted to underline everything. Don’t. * If you find yourself doing that, put your pencil to one side and read several paragraphs without underlining. That’s because you have to follow the main point, not to the details with which the writer is supporting that point. The details are there to convince you of something. What is the thing you are supposed to believe? Underline that. And THEN I take notes from my notes. The idea is to boil things down to their absolute minimum. Ideally, I will end up with a page or so for the entire book, if it’s really good. And then I can toss out the book if I want, or keep it handy if I think it’s a good reference. You see, I really value reading. I value it more than I do books. If I’m going to spend my valuable, limited time on reading, I do not want that time to be wasted. The book, to be useful to me, needs to make it into an easily accessible place in my brain, needs to become part of my understanding of the world, not a separate container of words that sits on my shelf with its pages slowly yellowing and foxing until the whole thing cracks down the spine when I pull it out. But I repeat: if you really want to understand something, read it so that you don’t have to read it again. Write all over it. Transform it. Make it into a tattoo on your brain. *This is why highlighters don’t work. They are too tempting to use, and they don’t require the time, effort, and meaning-making that a pencil or a pen produces. My students would get out their highlighters and go to TOWN, and it never did them any good. It’s possible to use a highlighter effectively, but it usually means re-reading a chapter, because you have to highlight only the most important phrases, and that means you have to know what they are already. †Most nonfiction books are very organized already. They are divided into parts, which have individual chapters, which make related sets of points, and often go back and forth from assertion to example and back to assertion, and often includes end-of-chapter assignments. ‡Lord knows, during my literature review, one of the most compelling things I came away with was the understanding that most researchers writing academic papers haven’t actually read half the documents in their lit review, just cherry-picked a point from the summary or from someone else’s publication. § You may find that as you are reading a book, the things you underline are things you already know really well. In that case, put your pen down and glance ahead. If you don’t see anything new, put the book down. No, put it in a bag to be donated. Toss it in the trash. Make it into a jewelry safe. If you already know it, you don’t need to read it. I laughed out loud and scared the dogs when I read the note about academic researchers. SO true, and one of my pet peeves. It killed me when I realized that! Here I was thinking everyone else had read so much more than I had. great tips! I get too carried away with highlighting when I do it, so I always have to remind myself to annotate in the margins / on another piece of paper as well. I like the idea of another piece of paper. I would lose the piece of paper, though 🙁 I’m the most organized disorganized person in the world). And I enjoyed a 2014 article from the NYT on the subject. I agree 100 percent, just saying it is my own mental barrier. I love opening an old book and reading notes another had left, best part of buying used books. I am just saying I always shy away from doing it myself. Oh, yeah, I get that! I had to teach myself to do it when I really actually wanted to learn something myself, because I was so nervous about defacing books.